Marshall Sloane, who said he has no plans to retire, goes to the Century Bank headquarters on Mystic Avenue in Medford and is involved in day-to-day operations. Marshall Sloane, just two years from turning 90, owns a contemporary six-bedroom home in Palm Beach, just steps away from the ocean. But instead of this beachside retreat, he prefers to spend his winters in a fifth floor office in Medford — with a view of Interstate 93. Sloane is chairman of Century Bank, the institution he founded 45 years ago and still guides. While many top banking executives retire with seven-figure payouts by the time they reach their 60s, Sloane charges into Century’s Medford headquarters almost every day. There he consults with his son, Barry, the chief executive, sits on committees that approve loans and interest rates, and determines where new branches should open. No job is too small: He still signs the $2 gift cards that new customers receive when they open an account. Sloane’s determination to come to work when most people tell him to go to Florida reflects a drive and stubbornness that have made him a force in the state’s banking industry and helped him build Century into one of the most successful community banks in Massachusetts. 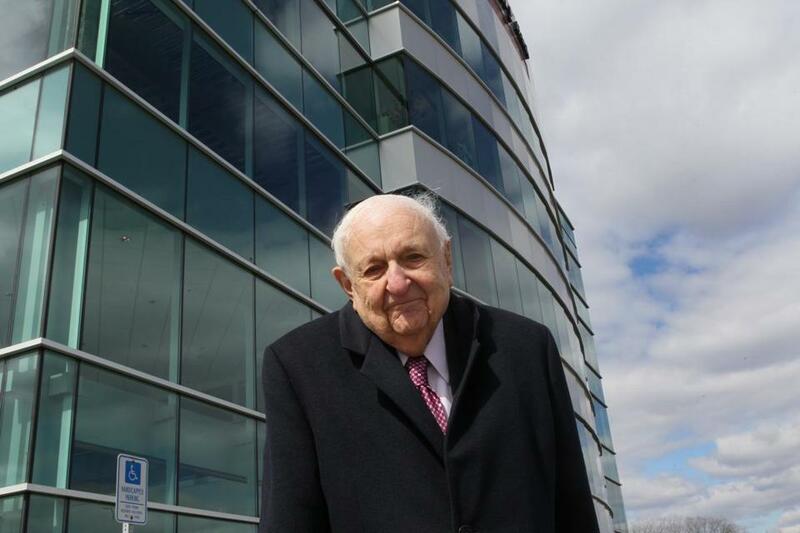 Throughout his career, Sloane has taken the bank into niches viewed as troublesome or unprofitable by competitors and found ways to make them pay, from handling municipal tax payments to working with check-cashing businesses. Century, which began in a trailer in a Somerville parking lot, now has 26 branches in Eastern Massachusetts and $2.7 billion in deposits, making it the state’s fifth largest community bank. Last year, it had earnings $20 million, according to financial filings. Sloane grew up in Somerville, working in his family’s furniture business, where he started out by riding his bike to collect payments from customers. Banking, however, was always in the background. His father bought a shuttered bank building across from their store in Magoun Square in the hopes of attracting another bank into the neighborhood. Before Sloane turned 30, he opened a small cooperative bank in that building, fulfilling the dream of his father, who died a few years earlier, in 1952, of cancer. Sloane later sold his small bank to a larger bank. But he wasn’t done with banking. In 1969, after selling Sloane Furniture Co., he launched Century, starting with a handful of investors and a secretary, who still works for him. He opened in a trailer while the first branch, on Fellsway West in Somerville, was under construction, and took in more than $1 million in deposits the first day. His early challenges included steering clear of the mob. The notorious Winter Hill gang, named after the Somerville neighborhood and later led by James “Whitey” Bulger, was still a force in the city. Sloane warned his employees to be aware of who wanted to open accounts and rent safety deposit boxes; Sloane himself rebuffed the deposits of an old schoolmate with ties to the Winter Hill gang. But Century still needed customers, and Sloane moved into businesses that other banks avoided because they were viewed as costly or difficult. Century, for example, dedicates a staff of six to check-cashing companies, reviewing transactions, inspecting checks for fraud, and visiting the firms to make sure they follow regulations. Recently, Century agreed to handle the business of a medical marijuana dispensary, even as other banks are avoiding this new industry over concerns about regulatory oversight, paperwork, and conflict with federal law, under which marijuana is illegal. 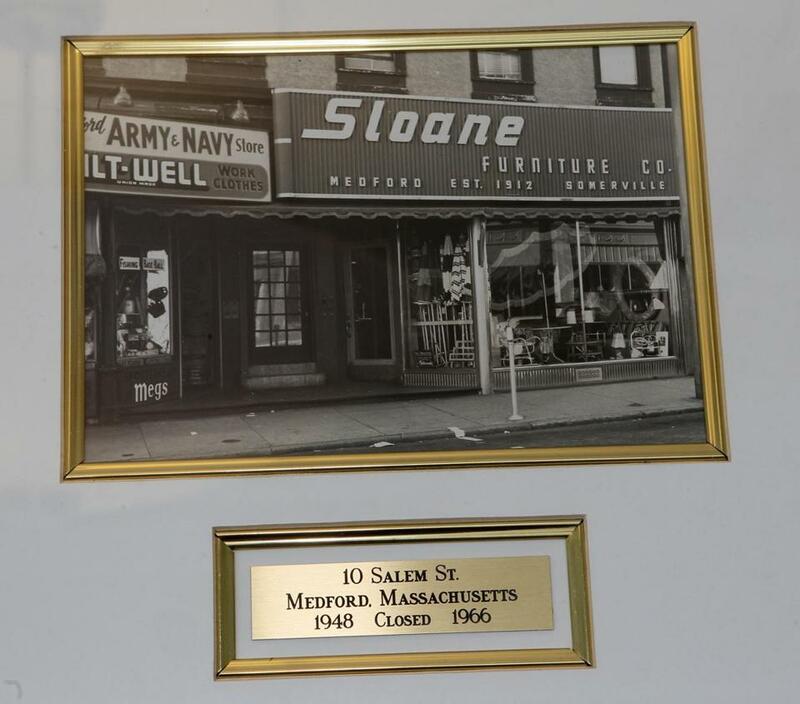 Marshall Sloane started out in the furniture business, with a store on Salem Street in Medford, shown in this photo of a photograph. The store closed in 1966. Sloane still thinks of himself as the Jewish kid from Somerville and an outsider in the clubby world of finance. He views banking primarily as a sales business. It’s about knowing your customers and anticipating their needs, he said, whether’s its a chintz couch or a certificate of deposit. Sloane built deposits by first asking friends to bank with Century, then their mothers. He would attend evening community meetings and Rotary Club gatherings to shake hands and make sure he and the bank were visible to potential customers. If a business client opened a new store, Sloane would be there, ready to help cut the ribbon, sometimes with his children in tow. Sloane and Century have been adept at using those connections to build the business, remaining loyal to customers even as other banks left them. Century became a dominant player in the municipal business by staying in when most small banks pulled out some two decades ago because of the costs of upgrading technology. Today, Century holds deposits of more than half the state’s 351 cities and towns, including Somerville, Cambridge, Weston, and Needham. Following the financial crisis, when credit markets froze and many large banks curbed lending to cities and towns, Century extended them loans for short-term needs. Since then, Century’s government loan business has grown to more than $500 million from less than $70 million in 2008, according to financial reports. But Sloane has been criticized for using connections to benefit his bank and himself. Sloan served as a trustee of his alma mater, Boston University, from 1993 to 2009. In 2003, critics said that BU trustees, including Sloane, were profiting by doing business with the university. At the time, Century provided more than $25,000 in banking services BU. Century remains one of three banks BU uses, and former BU president Jon Westling serves on the bank’s 14-member board of directors. Sloane said Century avoided “self-dealing” while on the board of trustees. “Any business we did with BU, we bid,” Sloane said. Over the years, Sloane has weathered other criticisms. In 2005, a handful of Century’s institutional shareholders criticized Century for failing to make more residential real estate loans in the booming market, and ignoring investor concerns, including ending one meeting with a shareholder by telling him, “Interview over,” and walking away, according to securities filings. The shareholders also claimed that Sloan too-quickly rebuffed offers to buy the bank and was too concerned with employing his family. Last year, the bank paid Sloane, his son, Barry, and daughter, Linda, a combined $2.6 million. Although a public company, Century’s shares are structured so Sloane and his family control the bank. Other shareholders earn twice the dividend of Sloane family members, but they have virtually no say in the direction of the bank. Sloane said he has delivered for shareholders. He recognized the real estate bubble of the last decade and avoided the excesses that damaged so many other banks. At the height of the financial crisis in 2009 and 2010, Century’s dividend payout ratio was double that of most banks. Nonetheless, Sloane said he always intended Century to be a family enterprise. He turned over day-to-day operations in 2005 to his sons, Barry, 59, and Jonathan, 55, hoping they would run the bank together. But in 2010, Jonathan Sloane resigned as co-chief executive, left the board of directors, and has since had little contact with his father. Sloane won’t say what caused the rift. “It’s one of the shames that he left,” Sloane said. Jonathan Sloane could not be reached for comment. Sloane hopes his children — and grandchildren — will run the bank long after he is gone. In the meantime, he has no thoughts of retiring. Sloane, who turned 88 this month, can’t be forced out because he holds the majority of the bank’s voting shares. As for that house in Florida, he recently put it up for sale.